Readers often ask me questions in comment streams and messages. I take a stab at answering some of them here. With readers' help, I hope to provide ideas about DGI concepts as well as some stocks to consider for further research. In my previous life -- long before I came up with the Dividend Growth 50 for Seeking Alpha -- I was a newspaper sports columnist based in Chicago. It was a pretty cool way to make a living. I wrote about subjects that millions of readers found interesting, I offered opinions and analysis about athletes and teams, I chronicled some amazing events and performances, and I got to travel the world. Thus was born one of my staples: a "mailbag" column in which I would respond publicly to readers' comments and emails. Recently, Seeking Alpha executive editor George Moriarty and I were batting around some ideas, and he suggested I put together an occasional "DGI mailbag" for this site. 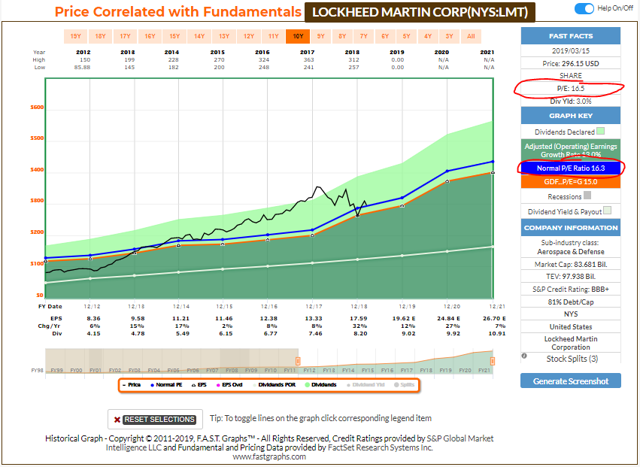 You own Boeing (BA), Honeywell (HON), 3M (MMM) and Lockheed Martin (LMT). If you did not own all 4 and were considering one at this point in time, which would it be? I'm not very comfortable giving "stock picks." I am not a financial adviser who writes a little, but rather a writer who has spent years learning (sometimes through trial and error) how to be a better investor. I mostly write about what I do and why I do it, and others can do their own research and make their own judgments. I do "like" all four industrial companies you named. Of them, MMM is my largest position because I started investing in it long ago and have added to my stake many times over the years. I appreciate that it is a conglomerate with tentacles in many industries, including health care and tech. It also is a Dividend King that has grown its divvy since the Eisenhower Administration. However, I also like weapons stocks because humans seem to love being able to threaten fellow humans with annihilation, so LMT and BA are always compelling. HON is a somewhat smaller version of MMM, and it also makes components that go into weapons ... so what's not to love? If I was forced to buy one today at current valuation, probably LMT (see FAST Graphs above), followed by HON. But really, any of them are worthy additions to any DGI portfolio. How's that for dancing around your question? 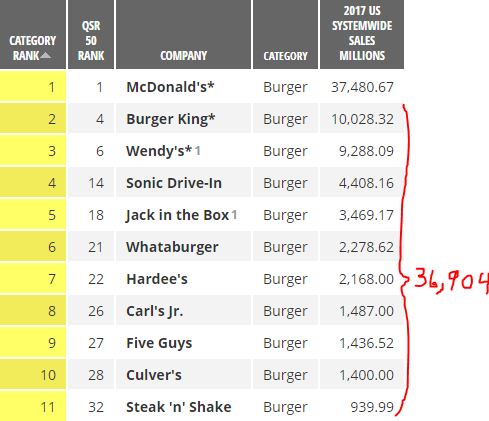 I seem to remember you referring to a statistic regarding McDonald's (MCD) being "bigger" than something like the following 10 franchises worldwide. I would really appreciate if you point me to that statistic. Seeing a similar chart from a couple years earlier helped me deal with all the gloom-and-doom predictions about McDonald's that were popping up on Seeking Alpha and elsewhere. Glad I didn't sell due to concerns that kale would take over the world, because Big Macs have been a great investment! I'm a 30-year-old man and I live in Spain. Since I've started to work I've invested in funds, but I've decided to start a DGI stock portfolio. I've read a lot of authors such as Benjamin Graham, Peter Lynch, Joel Greenblatt, and also, obviously, Seeking Alpha writers. My portfolio would focus on high-quality U.S. businesses with wide moats, but I think that I need to have a deeper understanding. What books or posts would you recommend? Another question is about stock price: How could I decide the correct price with a margin of safety? For example, Coca-Cola (KO) is a really good business, but I think it's expensive at this moment. 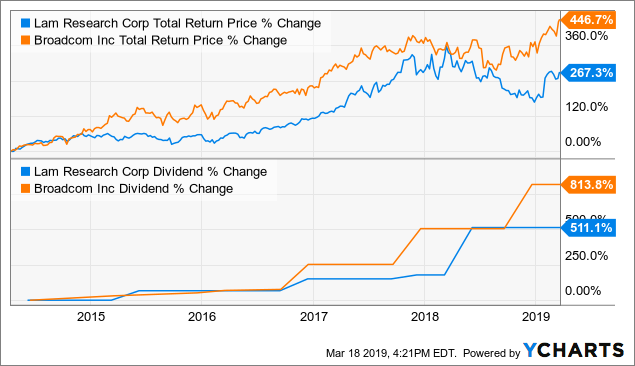 First, my Seeking Alpha colleague Dave Van Knapp has written about Dividend Growth Investing so well for so long that I call him The Godfather of DGI. His SA articles are listed HERE, and he also has authored a must-read DGI Primer. I could list many other SA contributors as well, but I would risk leaving out some good ones ... so take your time surfing the Dividends section of the site and coming up with your own favorites. Lowell Miller's "The Single Best Investment" is considered kind of a DGI bible; the first several sections about the strategy's concepts are especially valuable, and I have re-read them many times. And I'll make a little pitch for my own DG50 series of articles. Fellow SA contributor Eric Landis has compiled them on his DGI For The DYI site. As for valuation, I'm not sure which brokerage you use for stock purchases, but several have very good research available, especially Fidelity and Schwab. For instance, Schwab offers Morningstar, which has a wealth of valuation information. Many public libraries offer Morningstar and Value Line online, and there are plenty of other sites that provide valuation information -- including Seeking Alpha, whose "Mr. Valuation," Chuck Carnevale, created the FAST Graphs evaluation tool. 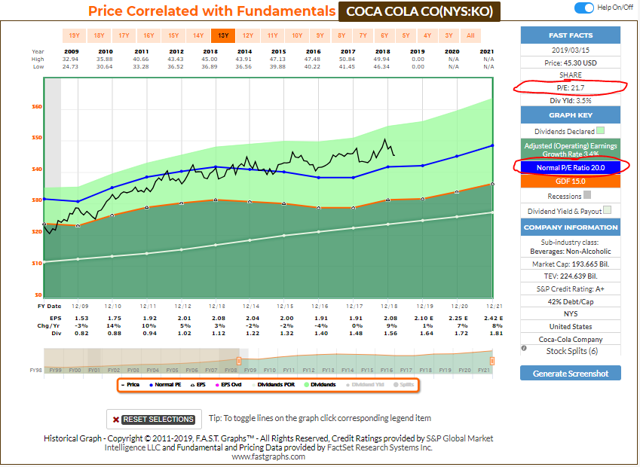 And speaking of FAST Graphs ... it indicates that although Coca-Cola might not be historically "expensive," KO certainly is not cheap. What is the actual dividend yield for Costco (COST)? 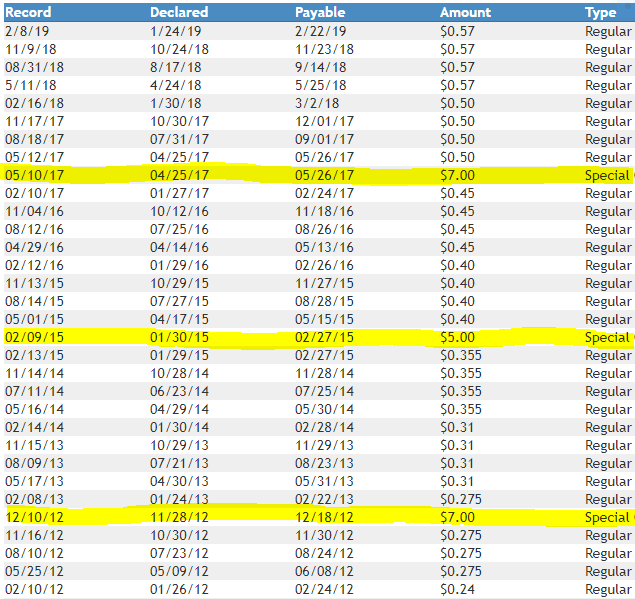 I know it states 1%, but COST has been distributing a "special dividend " every other year -- $7 last time. If I spread that over 2 years, that gives it a yield of 2.5%. 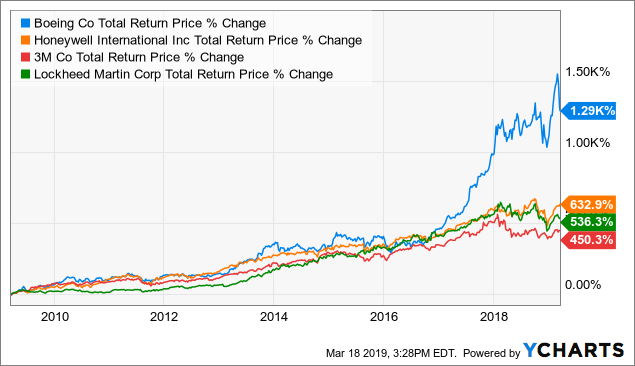 Unlike Main Street Capital (MAIN), which has been paying a special dividend every 6 months for the last several years (in addition to its regular monthly payout), Costco has only delivered three specials in its history. Who knows if COST will ever do another? Maybe the company will announce one in a month ... or maybe not for another 5 years ... or maybe never. Yes. I mean, our thoughts continue as they have been. The three we did were about two and a quarter years apart but that doesn't mean anything going forward. It's still a topic on the table and we continue to talk about it along with other things. So, really, not a whole lot of news to tell you about. Others can make projections based on hope, but I will continue counting on only the regular dividends -- and that means a 1% yield. I don't take MAIN's special dividend for granted, either. I'd rather be pleasantly surprised by any extra payouts. Which, I guess, is why they're called "special"! I recently ran across Lam Research (LRCX). The interesting thing is how aggressively it is raising the dividend. Also, the fact that it is down by about 29% this year and seems to have come off a low recently makes it interesting. I'm also looking for a budding dividend play, like Broadcom (AVGO). I just wondered if you've looked at it or considered it. I remember looking at LRCX many years ago and passing on it. I couldn't tell you why now, and that's certainly no signal that there's anything wrong with it. I haven't considered it lately because I can't own everything, and because I already hold come semiconductor companies ... including AVGO. Given the industry's cyclical nature, and the fact that I regard Broadcom as a somewhat speculative investment because of its BBB- credit rating, I doubt it will ever be one of my largest positions. Nevertheless, I do plan to add to my current smallish stake as long as nothing fundamentally changes with the company or its industry. Both Lam Research and Broadcom have bounced up in price since you messaged me a while back. Now, each company is near Morningstar's "fair value estimate" ($185 for LRCX and $300 for AVGO). I am in my mid-30s and I am looking for advice on sector allocation. I have read that I should probably have 60% allocated to defensive companies and 20% to both sensitive and cyclical companies. Would you agree with those numbers? What percentage should I target for each defensive sector -- staples 30%; health care 15%; utilities 15%? I don't really think along these lines. Although I do try to avoid getting too overweight in any sector, I pretty much just buy high-quality companies and keep most of them for years. "Chowder" is one of the long-time DGI gurus here on Seeking Alpha, and he definitely is into the kind of sector allocation you mention. I recommend checking out his Young Folk Portfolio blog. If you don't see your situation addressed there, use the comment stream to pose the very questions you asked me. I'm sure you will get some helpful responses, probably including one from Chowder himself. The plan is to make Mike's Mailbag a semi-regular feature on Seeking Alpha, but most of that will be up to you, the readers. In the meantime, I expect to have another Dividend Growth 50 update on the site in early April. Disclosure: I am/we are long AVGO, BA, HON, LMT, KO, MMM, MAIN. I wrote this article myself, and it expresses my own opinions. I am not receiving compensation for it (other than from Seeking Alpha). I have no business relationship with any company whose stock is mentioned in this article.